Let's start this review off with a big WOW! The Undead series is nothing short of amazing. I read the entire thing in a mere four days and was sad to see it end. It shocked me to find the series has yet to be picked up. RR Haywood spins a tale of Mr. Howie, a night shift grocery worker as he fights off the wretched undead and meets some pretty awesome people along the way. Howie first teams up with Dave, a fellow co-worker at the store. Dave is a killing machine, methodical and devoid of social grace, it came as no shock when he revealed having Asbergers. His dry demeanor mixed with Howie's witty humor makes for some pretty deadpan comedy.Joined by rookie soldiers Cookey, Blowers and Nick the comedy continues as they each dish out witty barbs. Each character is fully developed and believable. It's evident in the writing that a lot of thought went into creating them and the dynamic they bring to the group. Along the way, many more people are introduced. I won't go into their details, since that's the fun part about reading, but I will say they were each written just as well as the others.Despite the never ending battle to survive, Howie and company continue in their mission to secure a safe haven for refugees. Destruction never ceasing to knock down their doors, the action is non-stop.These aren't your garden variety zombies. They are a collective, pushed onward by an infection portrayed as an entity all it's own. The infection morphs and evolves in it's single minded goal to wipe out humanity. The undead aren't interested in eating its prey, it's only desire to spread the infection. There are zombies of all shapes and sizes. Slow and lumbering, fast and vicious, thinking and plotting, seducing, vengeful...you name it, they've got it. The one thing they have in common is the red eyes. Lucky for the eyes or survivors would be completely fubar. The infection itself is original. It allows what could have ended up long and drawn out to keep me on the edge of my seat and never bored.The Undead series is an ever changing, exciting work of fiction that will keep readers glued to the pages from start to finish. With it's terror, humor, unique story and likable characters, it is sure to be a huge hit with the masses.Important note: This series is not for the feint of heart. In addition to the blood and guts, there is a lot of bad language (most of it pretty hilarious) and a few sexually explicit scenes that may be shocking to some. I appreciate the authors show of restraint as he did not harp on the uncomfortable moments. Oh, and spiders...lest we not forget the spiders. Haywoods description of poor Paula as she is stalked by an eight legged terror had me squirming in my seat and making noises of fear and disgust, followed promptly by a full body check and scan of my surroundings to ensure I, too, was not about to be attacked.Visit www.bookie-monster.com to read my entire review. Really enjoyed this and the book before it. I think I've now caught up on the audiobooks which have been released, and I am excited for the announcement that the next in the series is available.Think the writing in this one was a little better, too. I know it's a cliché but I can't help but say how Haywood sure is improving like a fine wine. I haven't read many books where I'm mentally pacing back and forth after finishing one and waiting for the next to be released. 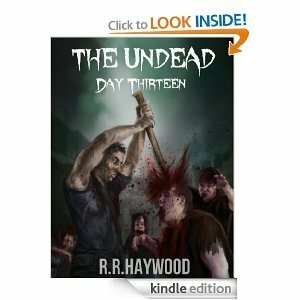 In some ways it's torture, and Haywood, good for you man!There's a theme running through each of my reviews for The Undead series - this story simply gets better and better and with every book I wonder how it can possibly top the previous one. But it does. Every time. I've been waiting for the inevitable to happen, and fans of this series will know what I mean. Haywood isn't afraid to kill off his characters and since around Day 8 I've had this feeling of dread, in a good way you understand. I didn't want it to happen. It couldn't happen. Not to him. On the other hand it felt inescapable. Sooner or later the bad thing had to reach out of the pages and slap me around the face.Days Twelve and Thirteen are an awesome ride. I've read well past my bedtime alarm because the characters wouldn't let me go to sleep. Two new characters are fantastic additions and they're arrival no less diminishes or eclipses the others. Once again the sub plots weave around one another, coming together with quality timing.Paula's early scenes in the office with Clarke make for uncomfortable yet compelling reading. I squirmed as things spiralled out of control, thinking "Jesus, this is really going to happen isn't it?" I like Paula for her courage and resolve to keep on going.But for me it's Roy who steals the show in Day Thirteen. Faced with zombies at every turn the only thing that scares him is the never ending fears he has about the multitude of ailments that aren't really there. And the teeth cleaning thing, hilarious! What bothers me now more than ever, and I'm sure it must bother other fans, is how it will all end. I don't want it to. I want our hero's to keep fighting, to keep my eyes glued to the page. Despite all this I hope there's a good ending, though not yet, perhaps around Day Thirty, just a suggestion Haywood!If these books were in print I'd have them all on my bookshelf, lined up, neat and tidy just how Roy would. Each one has been a total joy to read, not only for the action, banter, dark humour, excellent characters and everything in between, but because of the range of emotions I've experienced whilst standing beside these wonderful characters.Each time I finish reading I'm exhausted, overjoyed, anxious and fearful of what's coming next. If you're looking for a story where you're stood right next to the characters, feeling everything they feel and more, go start with Day One. You won't regret it. I really enjoyed this installment of the undead series. I definitely recommend that if you are looking at this review as a first time buy for the series, you should go back and read the last 12! Definitely worth the time and money.This book had me laughing so hard. My husband isn't a reader, so i found myself reading whole chapters to him. Especially the Paula chapters!There was one thing i didn't really care for...the ending. Now i am not going to give anything away, but i will say this, having read the previous 12 books, the ending was....expected. I kinda saw it coming. Good, but i called it.I wish there had been more bantering between Cookey and Blowers... but overall, i will probably read this one again. I cannot rate this series highly enough. It gets better every day and this last one actually made me cry. I was so caught up in the story and with all the characters that have grown over the series I was there in the midst of the chaos with them and I loved absolutely every part of it. You must read this series - seriously, right now! How is it possible??? every book just gets better and better!! I love Mr Howie and his team of missfits!! truly mindblowing!! AwesomeNever a dull moment... Funny as hell.. And answers many questions that have been popping up since the series began. R.R. Haywood - RR Haywood was born in Birmingham, England but has spent most of his life living on the beautiful south coast. He has had a passion for reading for as long as he can remember.One of his favourite genres is Post-Apocalyptic fiction and he has worked his way through every book he could find. Some were great and some not so great and what he wanted was a minute by minute, hour by hour, day by day detailed exploration of what would happen.This desire to explore the world after such an event gave birth to The Undead, which is now the UK's bestselling zombie horror series, compared to The Walking Dead and many other great works. This underground smash-hit series draws readers from all walks of life with compelling characters, incredible descriptions and breath taking action sequences that have had readers gripping their kindles, laughing out loud and crying real tears.